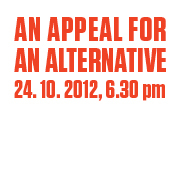 Wednesday, October 24th, 6.30 p.m.
Ludwig Museum – Museum of Contemporary Art (Library), Budapest 1095, Komor Marcell u. 1. The title of the roundtable discussion is inspired by Beuys’ idea that art should assume an active role in fostering societal change. Although his view reflects the institutional critique typical of the 1970s, its basic assumptions resurface from time to time within the art discourse; most recently exemplified by a critical stance towards contemporary politics, society and economics. We would like to know if the artists invited to our discussion see any possibility of transforming criticism into artistic practice, and if so, in what ways would this figure within their own work. What could the beuysian “social sculpture” mean in a contemporary context? How could an artist assume responsibility for the community? and global perspectives will be highlighted and discussed. This event takes place in the frame of SRIAT, a workshop and exhibition project initiated by Igor Metropol association. The language of the roundtable discussion is English. Free entry. Since his graduation from the Hungarian University of Fine Arts in the end 90ies, his work – interventions in public space, photo, video, mixed media installations – has been evolving within the overlaps of the social/political/artistic fields. Between 1998 and 2006 was working in the Big Hope project group with Scottish artist Dominic Hislop and from 2003 also with German artist Elske Rosenfeld. Big Hope did a series of participation-based social documentary projects and was widely exhibiting in Europe and beyond. Their first project Inside Out – snapshots by Budapest Homeless was included in the exhibition After the Wall – Art and Culture in Post-Communist Europe in Moderna Museet, Stockholm, in 1999, while the last, Commonopoly, was on show in Hamburger Bahnhof in 2004 and in the Iasi Biennial, Romania, in 2005. His work was included in exhibitions in Apex Art New York, Galerija Skc Belgrade, Le Fresnoy in Lille, Galerie für Zeitgenössische Kunst, Leipzig, at Manifesta 7 and Wiener Secession. From 1998 until 2000 worked in the Budapest-based Balázs Béla film studio as a curator and producer. Has translated books by Noam Chomsky, Guy Debord and Jacques Rancière into Hungarian. Lectured art theory in the Umea Konsthogskolan in Sweden and since 2008 has been associate professor at the Moholy Nagy University of Art and Design in Budapest where his programs primarily focus on the relation between engaged art and design. Selected solo exhibitions/projects: Pavilion for Revolutionary Free Speech within the exhibition: Speech Matters – Danish Pavilion, Giardini, 54th Biennale di Venezia, 2011 / State of Control – former GDR State Security (‘Stasi-‘) HQs, Berlin and Neuer Berliner Kunstverein (n.b.k. ), Berlin, 2009 / “A Lighthouse for Lampedusa!” (2008 – 2011) – Dispari & Dispari, Reggio Emilia, Italy. Szilvia Nagy is a curator and cultural anthropologist. After graduating from Cultural and Visual Anthropology (2003), she studied Anthropology and the Visual Image (Birkback University, London) and Photography (London College of Communication). She co-funded the Miskolc Institute of Contemporary Art (M.ICA) in 2008, where she curated exhibitions, workshops, public art projects and public programs until 2012. Szilvia Nagy started her studies at ELTE University, Faculty of Humanities, Doctoral Program in Film, Media and Contemporary Culture in 2010. Her PhD research focuses on the socio-cultural function in the art space, and progressive/ inclusive museums. Supervisors: Dr. Léna Pellandini-Simányi and Dr. Péter György. János Sugár studied in the Department of Sculpture at the Hungarian Academy of Fine Arts in Budapest. During his studies, between 1980 and 1986 he was actively involved in the exhibitions and performances of Indigo, an interdisciplinary art group led by Miklós Erdély. Sugár has participated in national and international exhibitions since the mid 1980-ies, in 1992 he exhibited at the documenta IX, Kassel, in 1996 Manifesta I, Rotterdam. He completed an Artslink residency at the Cleveland Institute of Art in 1994, and in 1997/98 a four-month, and in 1999 a three-month fellowship at Experimental Intermedia in New York. His films were screened in 1998 at the Anthology Film Archives in New York. Workshop: October 24th – November 5th, 2012. Exhibition Opening: November 5th, Location: Budapest, Bartók Béla út 29. SRIAT is realized in collaboration with the Intermedia, the Art Theory and Curatorial Studies Departments and TransPraxis – International Center for Art and Theory, of the Hungarian University of Fine Arts in Budapest.